Are the skin scar characteristics and closure of the parietal peritoneum associated with pelvic adhesions? To assess whether the abdominal scar characteristics and closure of the peritoneum were associated with pelvic adhesions. Patients who had undergone cesarean section between December 2015 and February 2016 were assessed prospectively in terms of age, gravida, body mass index, number of living children, number of cesarean sections, time passed since the last cesarean section, closure status of the peritoneum in the last cesarean section, presence of other diseases, smoking status, location of incision in the abdomen (medial, pfannenstiel) scar dimensions (length, width), scar status with respect to skin (hypertrophic, flat, depressive), scar color [color change/no color change (hyperpigmented/hypopigmented)], adhesion of bowel-omentum-uterus, omentum-anterior abdominal wall, uterus-anterior abdominal wall, uterus-bladder, bladder-anterior abdominal wall, fixed uterus, and uterus-omentum-anterior abdominal wall in abdominal exploration. One hundred five pregnant women who had undergone previous ceserean section surgery by the same physician, were at least in their 30th gestational week, had surgery notes about their previous operation, and had no chronic diseases were included in the study. Age, gravida, body mass index, number of children, number of cesarean sections, time passed since the previous cesarean section, closure/non-closure of peritoneum in the previous cesarean section, and smoking status had no effect on pelvic adhesions. Intraabdominal adhesion was not found to be associated with scar length [odds ratio (OR): 1.54, 95% confidence interval (CI): 1.1-2.2; p=0.02], depressive scar (OR: 9.3, 95% CI: 3.2-27.2; p<0.001), or hypopigmented scar [OR: 0.01, 95% CI: 0.003-0.11; p<0.001]. Adhesions following surgical operations are of great importance due to complications for the patient, complications in relaparotomy, and high costs. Depressive and hypopigmented abdominal scars may be associated with pelvic adhesions. We believe that closure or non-closure of the parietal peritoneum is not associated with pelvic adhesions. PRECIS: Although depressive and hypopigmented abdominal scars are associated with pelvic adhesion, there is no association between peritoneal closure and pelvic adhesions. In spite of advancements in surgical techniques and the emergence of substances that prevent adhesions, pelvic adhesions continue to be a problem for the patient and the physician. As in every surgical branch, pelvic adhesions also cause many long-term problems in gynecologic and obstetric operations. Major problems caused by pelvic adhesions include various complications such as organ damage in future operations, intestinal obstruction, and chronic pelvic pain(1). The aim of this study was to prospectively investigate whether surgical scar characteristics and closure/non-closure of the peritoneum in the previous operation were associated with pelvic adhesions. Pregnant women at the 30th gestational week or over who underwent cesarean section (CS) between December 2015 and February 2016 in the Van İpekyolu Maternity and Children’s Hospital and Yüzüncü Yıl University Faculty of Medicine, Department of Gynecology and Obstetrics, were included in the study. The study was approved by the University of Health Sciences, Van Training and Research Hospital Local Ethics Committee (approval number: 21.04.2015-2015/3). Informed consent forms were filled out by all participants. The participants had previously undergone at least one other CS by the same surgeon. The scar location in the previous CS, scar dimensions (length, width), scar’s status with respect to skin (hypertrophic, flat, depressive), scar color [color change/no color change (hyperpigmented/hypopigmented)] were noted retrospectively for the participants. Whether the parietal peritoneum was closed and pelvic adhesions during the operation were examined using the records of the previous CS. Those who did not have surgical operation notes, received scar revision in the previous operation, had chronic diseases (diabetes mellitus, inflammatory bowel diseases, Familial Mediterranean fever, endometriosis), had chronic steroid use, and low-molecular-weight heparin use were excluded from the study. In compliance with the literature, 4 different scores were used to assess abdominal adhesions in the most recent CS. No adhesions was scored as 0, filmy adhesions needing blunt dissection were scored as 1, strong adhesions requiring sharp dissection were scored as 2, and very strong vascularized adhesions that required sharp dissection and hardly preventable damage were scored as 3(2). The most current and the previous cesarean operations performed by the surgeons in the study involved cutting the skin and the subcutaneous tissue transversely at 2 cm above the pubic bone (Pfannenstiel incision) under general and spinal anesthesia, then blunt dissecting the rectus sheath with a finger, and entering the abdomen. After cutting the lower segment of the uterus transversely (Kehr incision), the infant was delivered. The uterus incision was closed in a continuous interlocking manner in a single layer and the endometrium, myometrium, and perimetrium layers facing each other (entering from the perimetrium and exiting from endometrium boundary; entering from endometrium boundary and exiting from perimetrium boundary) using absorbable 1-0 Vicryl suture (Ethicon, Piscataway, NJ). The abdomen was cleaned (amnion fluid and clots were removed), and checked for bleeding. The peritoneum was closed with 2-0 Monocryl (not closed in some cases). The rectus fascia was closed in a continuous manner using a 1-0 Vicryl suture (Ethicon, Piscataway, NJ). After the subcutaneous bleeding inspection, the skin was closed with a 2-0 Monocryl suture subcutaneously. Prophylactic antibiotic was given intraoperatively to all patients after delivery of the fetus (urgent, elective) as 1 g intravenous cefazolin sodium. Descriptive data are presented as mean ± standard deviation, median, and ratio. The non-parametric Mann-Whitney U test was used to compare data between the groups. p<0.05 was considered to be statistically significant. SPSS 22.0 was used for data analysis. Logistic regression analysis was used to determine significant predictors of intraabdominal adhesions. In the logistic regression, intraabdominal adhesion scores were used as dependent variables, and age, gestational week, body mass index (BMI), smoking, parity, the number of previous CS, time passed since the previous CS, the presence of peritonization in the previous CS, and skin scar (length, width, color, pigmentation) were used as independent variables. The data were stored in STATA 13.0 (Stata Corporation, Texas, USA) and the entire analysis was performed using this system. P<0.05 was accepted as the level of statistical significance. 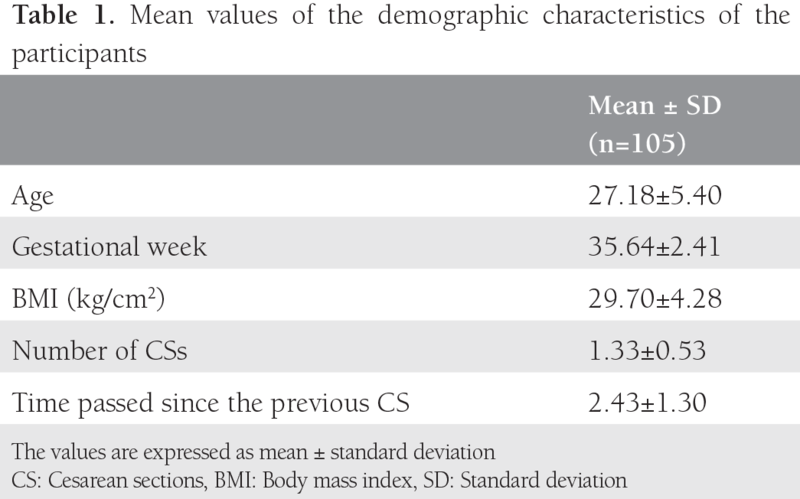 The demographic characteristics of the patients including age, gestational week, BMI, number of CSs, and time passed since the previous CS can be seen in Table 1 as mean values and standard deviation. 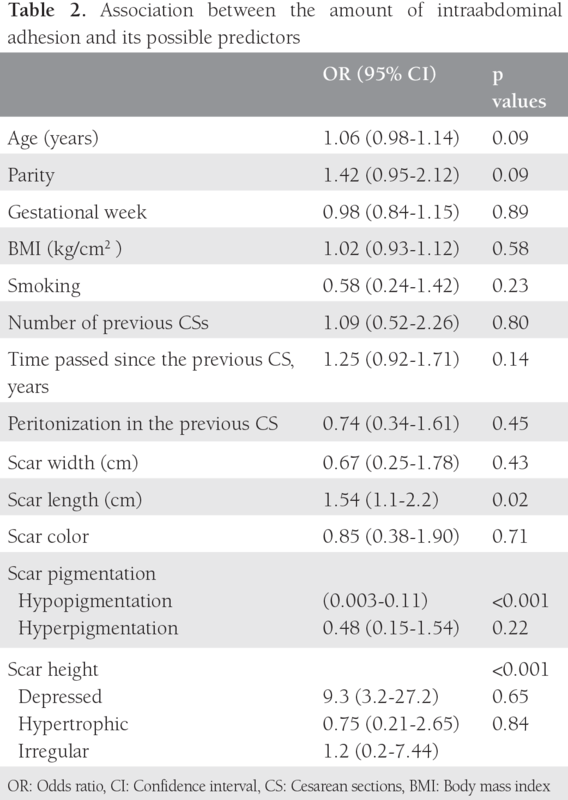 Age, gestational week, BMI, smoking, parity, the number of previous CSs, time passed since the previous CS, and the presence of peritonization in the previous CS had no effect on the probability of intraabdominal adhesions (Table 2). There was a significant association between scar length [odds ratio (OR): 1.54, 95% confidence interval (CI): 1.1-2.2; p=0.02], depressed scar (OR: 9.3, 95% CI: 3.2-27.2; p<0.001), hypopigmented scar (OR: 0.01, 95% CI: 0.003-0.11; p<0.001) and the amount of intraabdominal adhesions. No association was found between scar color and the amount of intraabdominal adhesions. The incidence of adhesions following surgical operations is reported to be 93%, which is a very high level(3). Such adhesions occur in one tenth or more of the patient’s abdominal cavity(4). Adhesions following surgical operations may lead to infertility, organ damage due to adhesions in future operations, intestinal obstruction, and chronic pelvic pain(5). Higher numbers of CSs received by patients leads to more frequent organ damage in following relaparotomies. The annual cost incurred due to complications caused by pelvic adhesions is estimated to be 1.2 million dollars in the United States(6). Independent from bleeding, the physiopathology of intraabdominal adhesions following surgical operations is reported to be induced by fibrin clots due to fibrinogen activated by the tissue factor or more specifically, the “fibrin gel matrix”(7). Fibrinogen emerging from surfaces damaged during the surgical operation is a soluble protein, which forms fibrin monomers by reacting with thrombin and polymerizes. Fibrin polymers must be removed when they emerge because they are initially soluble. If they remain for prolonged periods, they contact with certain coagulation factors such as Factor XIIIa, become insoluble, and form a fibrin gel matrix(8). Damage in the peritoneum associated with trauma and ischemia induces a quick response and the damaged regions are closed by neutrophils within four hours. Complete healing after constant reactions occurs within approximately one week(9). As can be understood from the information given above, the formation of adhesion begins with the release of tissue factors. For this reason, the size of the scar may be associated with intraabdominal adhesions. We found a relationship between cesarean incision and intraabdominal adhesion (OR: 1.54, 95% CI: 1.1-2.2; p=0.02). The hypothesis that peritoneal fibrinolytic activity plays an important role in the pathophysiology of the dissociation of adhesions has been suggested(7). Tissue plasminogen activator (tPA) in mesothelial cells is a significant natural defense against the formation of adhesions following surgical operations. Active fibrinolysis enzymes, which emerge from inactive plasminogen via tPA, turn the fibrin gel matrix into fibrin destruction products that have no effect on the formation of adhesions(7). If local fibrinolysis is sufficient, fibrinous adhesions are lysed. If it is not sufficient, connective tissue formation and adhesion development may occur(9). It was observed in many studies that closure of the parietal peritoneum increased adhesions in gynecologic operations,(10) general surgical operations,(11) and animal experiments(12). Based on the above data, the parietal peritoneum is routinely closed in gynecologic and obstetric operations(10,13). However, some other studies reported that, unlike other abdominal operations, closure of the peritoneum decreased pelvic adhesions in pregnant women(14). However, with respect to the significance of the fibrinolytic activity in the pathophysiology explained above, amnion fluid was found to show significant fibrinolytic activity after the 37th gestational week(15). Myers and Bennett(16) and Roset et al. (17) reported that the closure of the parietal peritoneum reduced adhesions in pregnant women. In the present study, we found intraabdominal adhesions were not affected by whether the parietal peritoneum was closed (OR: 0.74, 95% CI: 0.34-1.61, p=0.45). The healing phases of skin scars includes the inflammatory phase (including the injury and prevents infection), the proliferative phase (granulation of macrophages, proliferative degeneration, and characterized by epithelial tissue), and the remodeling phase (regulation of the extracellular matrix), which is a long process. Considering the significant points of the molecular biology behind the healing of scars, the factor that is effective at the molecular level is transforming growth factor-beta (TGF-β)(18). In adults, TGF-β and receptors are observed to be evidently active in scar tissue and involved in scar formation at the site of injury. However, TGF-β expression is temporary in the fetus and does not form scar tissue(19). Additionally, fibroblasts were observed to synthesize proteins involved in continuous TGF-β signal transduction in both hypertrophic scars and keloids(20,21,22,23,24). The number of studies on the relationship between scar tissue and intraabdominal adhesions is limited. However, Salim et al. (25) found that, among all abdominal scar characteristics, only depressive scars were associated with an increase in number and severity of evident adhesion incidence. Also, the incidence of frozen pelvis was found to increase by almost 12 times in women with depressive scars compared with those without depressive scars. Similar to many other researchers, Ferreira et al. (26) reported that hormonal, immunologic, genetic, and tissue growth factors played significant roles in scar development. Nissen et al. (27) showed that filmy intraabdominal adhesions, excessive fibrovascular structures, and depressive scars led to hypertrophic scars and might be affected by tensile strength. In this study, we found that hypopigmentation and depression of scars were associated in with intraabdominal adhesions (p<0.001, p<0.001). It was reported in a previous study that there was no significant difference between women who underwent CS only once and women who underwent CS two or three times in terms of intraabdominal adhesion incidence(25). According to other studies, no difference was reported between women with multiple abdominal incisions and women with a single abdominal incision in terms of intraabdominal adhesions(28,29). Similarly, we observed no statically significant difference between women with different numbers of CSs in terms of abdominal adhesions (OR: 1.09, 95% CI: 0.52-2.26; p=0.80). A limitation of our study is the small number of patients. Another limitation is that we did not emphasize whether the first cesarean operation of patients was performed as an emergency or electively. Adhesions following surgical operations are of great importance due to complications for the patient (e.g., infertility, chronic pelvic pain), and complications in relaparotomy, and high costs. Depressive and hypopigmented abdominal scars provide important information for preoperative prediction of pelvic adhesions. We found that closure or non-closure of the parietal peritoneum was not associated with pelvic adhesions. We believe that more comprehensive studies are required to explain the effect of factors involved in pelvic adhesions. Ethics Committee Approval: The study was approved by The Republic of Turkey Ministry of Health Van Training and Research Hospital Local Ethics Committee (approval number: 21.04.2015-2015/3). Surgical and Medical Practices: N.Ç., E.E., Concept: N.Ç., Design: N.Ç., E.E., Data Collection or Processing: E.E., G.G.E., N.A., Analysis or Interpretation: N.Ç., E.E., R.Y., Literature Search: N.Ç., E.E., N.A., Writing: N.Ç. 1. Al-Took S, Platt R, Tulandi T. Adhesion-related small-bowel obstruction after gynecologic operations. Am J Obstet Gynecol 1999;180:313-5. 2. Coccolini F, Ansaloni L, Manfredi R, Campanati L, Poiasina E, Bertoli P, et al. Peritoneal adhesion index (PAI): proposal of a score for the “ignored iceberg” of medicine and surgery. World J Emerg Surg 2013;8:1-6. 3. Menzies D, Ellis H. Intestinal obstruction from adhesions -- how big is the problem? Ann R Coll Surg Engl 1990;72:60-3. 4. Luijendijk RW, de Lange DC, Wauters CC, Hop WC, Duron JJ, Pailler JL, et al. Foreign material in postoperative adhesions. Ann Surg 1996;223:242-8. 5. ten Broek RP, Issa Y, van Santbrink EJ, Bouvy ND, Kruitwagen RF, Jeekel J, et al. Burden of adhesions in abdominal and pelvic surgery: systematic review and met-analysis. BMJ 2013;347:f5588. 6. Ray NF, Larsen JW, Stillman RJ, Jacobs RJ. Economic impact of hospitalizations for lower abdominal adhesiolysis in the United States in 1988. Surg Gynecol Obstet 1993;176:271-6. 7. Holmdahl L, Eriksson E, al-Jabreen M, Risberg B. Fibrinolysis in human peritoneum during operation. Surgery 1996;119:701-5. 8. Rodgers KE, diZeregga GS. Function of peritoneal exudate cells after abdominal surgery. J Invest Surg 1993;6:9-23. 9. Holmdahl L, Eriksson E, Eriksson BI, Risberg B. Depression of peritoneal fibrinolysis during operation is a local response to trauma. Surgery 1998;123:539-44. 10. Tulandi T, Hum HS, Gelfand MM. Closure of laparotomy incisions with or without peritoneal suturing and second-look laparoscopy. Am J Obstet Gynecol 1988;158:536-7. 11. O’Leary DP, Coakley JB. The influence of suturing and sepsis on the development of post-operative peritoneal adhesions. Ann R Coll Surg Engl 1992;74:134-7. 12. Swanwick RA, Stockdale PHG, Milne FJ. Healing of parietal peritoneum in the horse. Br Vet J 1973;129:29-35. 13. Bamigboye AA, Hofmeyr GJ. Closure versus non-closure of the peritoneum at cesarean section. Cochrane Database Syst Rev 2003;CD000163. 14. Lyell DJ, Caughey AB, Hu E, Daniels K. Peritoneal closure at primary cesarean delivery and adhesions. Obstet Gynecol 2005;106:275-80. 15. Pschera H, Kjaeldgaard A, Larsson B. Fibrinolytic activity in amniotic fluid during late pregnancy. Acta Obstet Gynecol Scand 1986;65:417-20. 16. Myers SA, Bennett TL. Incidence of significant adhesions at repeat cesarean section and the relationship to method of prior peritoneal closure. J Reprod Med 2005;50:659-62. 17. Roset E, Boulvain M, Irion O. Nonclosure of the peritoneum during caesarean section: long-term follow-up of a randomised controlled trial. Eur J Obstet Gynecol Reprod Biol 2003;108:40-4. 18. Tziotzios C, Profyris C, Sterling J. Cutaneous scarring: Pathophysiology, molecular mechanisms, and scar reduction therapeutics: Part II. Strategies to reduce scar formation after dermatologic procedures. J Am Acad Dermatol 2012;66:13-24;quiz 25-6. 19. 1Martin P, Dickson MC, Millan FA, Akhurst RJ. Rapid induction and clearance of TGF beta 1 is an early response to wounding in the mouse embryo. Dev Genet 1993;14:225-38. 20. Schmid P, Cox D, Bilbe G, McMaster G, Morrison C, Stahelin H, et al. TGF-beta s and TGF-beta type II receptor in human epidermis: differential expression in acute and chronic skin wounds. J Pathol 1993;171:191-7. 21. Scott PG, Dodd CM, Tredget EE, Ghahary A, Rahemtulla F. Immunohistochemical localization of the proteoglycans decorin, biglycan and versican and transforming growth factor-beta in human post-burn hypertrophic and mature scars. Histopathology 1995;26:423-31. 22. Lee TY, Chin GS, Kim WJ, Chau D, Gittes GK, Longaker MT. Expression of transforming growth factor beta 1, 2, and 3 proteins in keloids. Ann Plast Surg 1999;43:179-84. 23. Desmouliere A, Geinoz A, Gabbiani F, Gabbiani G. Transforming growth factor-beta 1 induces alpha-smooth muscle actin expression in granulation tissue myofibroblasts and in quiescent and growing cultured fibroblasts. J Cell Biol 1993;122:103-11. 24. Roberts AB, Sporn MB, Assoian RK, Smith JM, Roche NS, Wakefield LM, et al. Transforming growth factor type beta: rapid induction of fibrosis and angiogenesis in vivo and stimulation of collagen formation in vitro. Proc Natl Acad Sci USA 1986;83:4167-71. 25. Salim R, Kadan Y, Nachum Z, Edelstein S, Shalev E. Abdominal scar characteristics as a predictor of intra-abdominal adhesions at repeat cesarean delivery. Fertil Steril 2008;90:2324-7. 26. Ferreira LM, Gragnani A, Furtado F, Hochman B. Control of the skin scarring response. An Acad Bras Cienc 2009;81:623-9. 27. Nissen FB, Spauwen PH, Robinson PH, Fidler V, Kon M. The use of silicone occlusive sheeting (Sil-K) and silicone occlusive gel (Epiderm) in the prevention of hypertrophic scar formation. Plast Reconstr Surg 1998;102:1962-72. 28. Levrant SG, Bieber E, Barnes R. Risk of anterior abdominal wall adhesions increases with number and type of previous laparotomy. J Am Assoc Gynecol Laparosc 1994;1:S19. 29. Ashrafinia M, Vazirichimeh Z, Dastjerdi MV, Moiini A. Adhesion formation in patients with previous laparo-tomies. J Am Assoc Gynecol Laparosc 1996;3:S2.